Futasuji L 5.5″ Left Handed Hair Cutting Scissors Satin Finish. These are the Left Handed Futasuji L 5.5″ Hair Scissors with offset grip and flat key tension adjuster. These Left Handed Hair Scissors are made from the Highest Quality Forged Japanese Hitachi SUS 440C Stainless Steel (Rockwell Hardness of 60+) with an elegant and durable brushed satin finish. 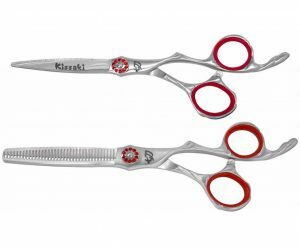 This Futasuji L 5.5″ Left Handed Hair Cutting Scissors Satin Finish is an ideal Hair Cutting Shears for Left Handed professional Hairstylists, Hairdressers and Barbers in high volume hair cutting salons.